Centurion Labz Rage is one of the strongest pre-workouts on the market. The formulation comprises 33 servings with huge amounts of active ingredients which gives you a strong energising effect and muscle pump. In addition, they enhance focus, consequently making your training even more efficient and stimulating greatly muscle growth. Creatine monohydrate – the most popular anabolic substance whose effects were confirmed by numerous studies. This tripeptide, occurring naturally in the body and synthesised in the liver, is composed of amino acids – glycine, arginine and methionine. It can be found in tissues with high energy requirements, i.e. nervous tissue, vascular endothelium and primarily skeletal muscles. Creatine is largely responsible for providing a quick source of energy which is required for a muscle contraction. Because of that, its adequate amounts in cells increase considerably the endurance of muscle fibres and thus allow you to do more reps or lift heavier weights (9 kg for 8 weeks in studies). Creatine does not only function as a source of metabolic energy. It is referrred to as a hormone-like substance – creatine may inhibit effectively the activity of myostatin (a protein which limits muscle growth) and initiate the biosynthesis of structural proteins, the most important process while building muscle mass. L-arginine – the direct precursor to nitric oxide which is synthesised mainly in vascular epithelium in the presence of the enzyme synthase. Its main task is to dilate blood vessels. Owing to that, muscles are better supplied with blood rich in nutrients and oxygen which are required for muscle function. What is more, this amino acid is one of the substrates of the urea cycle, which takes place in the liver and is aimed at cleasing the body of waste metabolic products, among others, excess nitrogen compounds released from muscle cells. Beta-alanine – a cysteine metabolite which participates in the synthesis of two compounds that are vital to muscles – coenzyme A and carnosine. The first one is necessary for normal aerobic metabolic processes which facilitate the production of energy for normal muscle function. It can be thus said that it enhances effects of creatine because it enables this tripeptide to store the produced energy. Carnosine acts as a buffer because it reduces concentrations of acids (including lactic acid) which are formed in metabolic processes during intense strength workouts. As a result, it prevents disturbances in energy metabolism and reduces muscle pain, thereby enhancing the effectiveness of training sessions. Agmatine sulphate – a salt of biogenic amine which is produced in the liver from arginine and then distributed to other tissues, reaching even the central nervous system. It increases the synthesis of nitric oxide (NO) by activating alpha-2 adrenergic receptors. It stimulates the activity of nitric oxide synthase found in the vascular endothelium (eNOS) and inhibits its other isoenzymes (iNOS and nNOS) which affect adversely health (among others, they promote the production of free radicals). What is more, agmatine maintains carbohydrate balance by stabilising blood glucose levels. This is because it stimulates the production of glucose transporters (GLUT4) in muscles and boosts levels of beta-endorphin – a substance inhibiting gluconeogenesis in the liver and inducing insulin secretion in beta-pancreatic cells. Caffeine anhydrous – the most popular compound of methylxanthines whose molecular effects involve an increase in intracellular cAMP levels. This is important because it results in enhanced lipolysis and helps activate “the enzymatic machinery”, which is required for reducing excess body fat. In addition, caffeine binds to purinergic receptors, thereby having central effects – a reduction in fatigue and improvement in physical and intellectual performance. Coca bean extract is a source of many active substances, such as allantoin, choline, flavonoids, amino acids, triterpenes, guanidine derivatives, inositol and vitamins. It exerts many positive effects, among others, it helps block amylase, thereby resulting in reduced sugar absorption and weight loss. In addition, it allows you to remove excess water from the body and has thus an impact on renal function. It is a perfect ingredient of thermogenic complexes in combination with caffeine and bitter orange. Theobromine is another methylxanthine whose high concentractions can be found in the plant called Cocoa Theobroma. Its effects are similar to caffeine. However, combining methylxanthines improves their effectiveness. Furthermore, theobromine helps reduce inflammation which could hinder muscle recovery. Kaempferol – a natural flavonoid with effects that are typical of compounds from this group. First of all, it is an amazing antioxidant which protects from free radicals which are involved in, among others, carcinogenesis. Furthermore, it has protective effects and prevents the development of type 2 diabetes by affecting intracellular enzymatic activity at the molecular level. Synephrine – a natural substance isolated from bitter orange. It increases significantly blood pressure because it activates the sympathetic nervous system, especially beta-3 adrenergic receptors located in adipocytes. Owing to that, it has thermogenic and lipolytic effects which are associated with the activation of this type of receptors. It may also reduce food intake by inhibiting hunger pangs. 1,3-Dimethylamine – the chemical name of the popular DMAA, a substance which belongs to aliphatic amines. It affects the activity of neurotransmitters by inhibiting the reuptake of catecholamines and inducing their secretion. As a result, it has strong energising and thermogenic properties. It unlocks its potential in combination with caffeine, which is also found in this supplement. Hordenine – a compound which is classified among nootropic substances. Its action is to stimulate the secretion of noradrenaline which has an energising effect (especially in conjunction with caffeine and synephrine). What is more, it affects body fat reduction by speeding up this process. Naringin belongs to flavonoid glycosides occurring naturally in citruses. It supports the body because it is a perfect antioxidant. Because of that, it protects against the formation of free radicals and lowers blood bad cholesterol levels. It speeds up also metabolic processes and thus allows you to burn excess weight in the form of body fat. Mucuna Pruriens is a plant which contains L-DOPA, the precursor to dopamine, an important neurotransmitter to the functioning of the central nervous system. This substance has a major role in mood modulation, prevents drops in motivation and has antidepressant effects. It is also of key importance for the functioning of the part of the brain responsible for voluntary movements. Dopamine release facilitates normal coordination of muscle movements (also during training) by the central nervous system. D-Glucurono-3,6-lactone – a glucose metabolite formed in the liver. It may be converted into xylitol, glucaric acid and L-xylulose. As a derivative of glucuronic acid, it has detoxifying properties – by binding to toxins, it increases their solubility in water and promotes their excretion via the kidneys. Hingenamine is an agent which belongs to agonists of beta-2 adrenergic receptors. They contribute to widening bronchi, thereby improving significantly gas exchange and resulting in increased oxygen supply to the trained muscles. What is more, it causes vasodilation and that is why the transport of oxygen and nutrients is even easier. Yohimbine HCl – the salt of yohimbine derived from the plant called yohimbe which acts as an agonist for alpha-2 adrenergic receptors. It contributes to an increase in the secretion of noradrenaline in the blood, thereby exerting a stimulant effect and promoting the loss of excess body fat. Another “bonus after a workout” may be its aphrodisiac properties. Vitamin D – a compound vital primarily to normal functioning of the skeletal system. It promotes the absorption of calcium from food and prevents its urinary excretion. Owing to that, it facilitates normal mineralisation of bone tissue – important supporting tissue which is a component of the motor system with muscle tissue. Vitamin C is used in the body in many processes. One of these is the production of collagen – an important structural protein of connective tissue which is responsible for healthy bones, skin, tendons, ligaments and fasciae. Because of that, it aids the formation of healthy components of joints and promotes the functioning of the motor system. What is more, ascorbic acid aids the production of hormones and neurotransmitters such as catecholamines – noradrenaline and adrenaline. As a result, it may help also maintain hormonal homeostasis. Calcium – one of the most important microelements. Apart from its obvious role in bone tissue formation, it regulates also muscle contractility. It is essential to the function of neuromuscular junction because it is involved in the secretion of vesicles with neurotransmitters – substances which help muscles perform their function. These effects explain why it was necessary to include this element in the formulation – to support a healthy motor system. Folic acid and vitamin B12 – very important substances regulating nervous system function which is crucial to neurotransmitter synthesis. As a result, they promote well-being and normal muscle function. They are involved in blood formation processes – their presence is essential to normal structure of red blood cells which carry oxygen required for effective muscle function. To sum up, Centurium Labz Rage is a highly advanced pre-workout which will meet the expectations of the most experienced users. The blend contains 21 active ingredients, has a potent energising effect and enhances focus, even in the most resistant individuals. What is more, it promotes body fat reduction. Take ½ measure or 1 measure 30 minutes before training. Due to the very strong effect, you should start using half the portion. The supplement is designed for physically active individuals, regardless of their training goal or regime. It is useful in building muscle mass and for endurance training. It may be also used to lose excess body fat. The supplement should be taken with caution by individuals on psychiatric medications which act on the nervous system. In this case, it is recommended to consult with a doctor before starting supplementation. 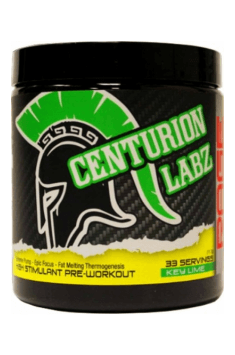 Centurion Labz is a company from the United States, whose founders are Dr. Nicholas Puccio and Dr. Nicholas Kepko, who was guided by the main goal - the production of the highest quality dietary supplements and nutrients for athletes based on scientific facts and research. Currently, the products of this brand are distributed outside the US all over the world and support athletes at amateur level, as well as people permanently associated with the world of bodybuilding - an example is the six time IFFB winner, who was an inspiration to create a series of Quadro products. Citric Acid, maltodextrin, calcium silicate, natural & artificial flavors, sucralose, acesulfame K.
Bitter apricot seed extract has anti-carcinogenic and anti-inflammatory properties. Guduchi supports the body's natural response to daily stress and promotes vitality.